ITV has apologised after a rat was killed and cooked during this year's I'm a Celebrity...Get Me Out of Here! It also said it would tighten up its procedures. The producers will not face charges over alleged animal cruelty on the show, Australian police have said. Charges are being brought against the winner, chef Gino D'Acampo and contestant Stuart Manning after they cooked a rat to eat. The pair have been ordered to appear in court on 3 February 2010. The RSPCA in New South Wales said it was "not acceptable" an animal had been killed as part of a performance. "The production was asked if a rat could be caught and eaten by the celebrities in exile camp to supplement the basic rations they had been provided with for their evening meal," said a spokesman for ITV. "Having sought health and safety advice, the go-ahead was given purely on this basis... the production was unaware that killing a rat could be an offence." He added that ITV accepted that further inquiries should have been made. "ITV apologises for this error, and to the celebrities concerned, and will put in place procedures for next year's series to ensure that this cannot happen again." During the series, the contestants were divided into two groups, one of which was in "exile" with meagre rations. 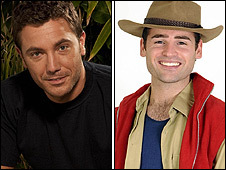 As the celebrities became concerned that they would lack the energy to complete physical challenges, D'Acampo, 33, decided to kill and eat the rat to add meat to the group's meal. He told the show's video diary room, the Bush Telegraph: "It's not done by choice but it's done because we need it. We need some kind of protein, we need some kind of flavour. "I saw one of these rats running around. I got a knife, I got its throat, I picked it up." Fellow contestant George Hamilton spoke out in defence of D'Acampo, telling the Daily Mirror that ITV producers had given them permission to eat the rodent. The actor said: "I went into the Bush Telegraph and said, 'May we eat a rat?' They were a bit shocked, thought about it and then said we could. It was a very good dinner." Chief Inspector David Oshannessy, from the RSPCA in New South Wales, told BBC Radio 5 live there was a "code of practice" which dictated how animals could be used in theatrical productions and films. "The killing of a rat for a performance is not acceptable. The concern is this was done purely for the cameras," he said. The charity sends staff whenever animals are used for filmed or live performances, he said, and so had been in contact with the programme's producers before the rat was killed. "But we received no pre-notice or advice this segment was going to occur, it happened on a day no animals were featuring in production, so we didn't have an officer there," Chief Inspector Oshannessy added. Chef Antony Worrall Thompson, who appeared on the reality show in 2003, said the programme's producers should take some responsibility for the incident. He said an announcement had been made warning him not to kill spiders while he was in the camp because they were a protected species. "Maybe the producers are at fault for not warning them," he told Sky News. "Personally, I would be looking further up the field." ITV issued a brief statement saying: "The Australian RSPCA are currently investigating an incident that a rat was killed in the camp."